Fletcher the friendly sea turtle and his bickering barnacle buddies, Barney and Barry, are searching for a permanent home on Dodo Island. But when Wink, a one-eyed seagull, crash lands into them, they are soon on a mission to help him return home. Thanks to Babs the dodo, they’ll have a bird’s eye view of the ocean and Wink’s nesting ground. But only if she can escape from an oil spill. 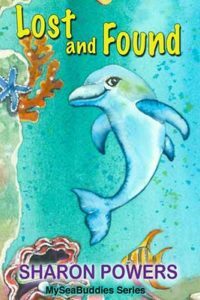 It will take the help, and smarts, of all the MySeaBuddies, and their new friend Wink, to rescue Fletcher’s one true love. LOST AND FOUND continues where BARNEY AND BARRY, THE HITCHHIKERS left off with its lovable and enduring characters, and their wonderful underwater world, navigating their adventurous lives. It’s the second book in Sharon Powers MySeaBuddies series.